A great example where you need agile, fail-fast development is blockchain because it is a very hot topic, but frameworks are immature and change very frequently these days. Note that blockchain is not just about Bitcoin and finance industry. This is just the tip of the iceberg. Blockchain, which is the underlying infrastructure of Bitcoin, will change various industries, beginning with banking, manufacturing, supply chain management, energy, and others. A key for successful blockchain projects is middleware as it allows integration with the rest of an enterprise architecture. Blockchain only adds value if it works together with your other applications and services. See an example of how to combine streaming analytics with TIBCO StreamBase and Ethereum to correlate blockchain events in real time to act proactively, e.g. for fraud detection. The drawback of blockchain is its immaturity today. APIs change with every minor release, development tools are buggy and miss many required features for serious development, and new blockchain cloud services, frameworks and programming languages come and go every quarter. This blog post shows how to leverage cloud integration with iPaaS and API Management to realize innovative projects quickly, fail fast, and adopt changing technologies and business requirements easily. We will use TIBCO Cloud Integration (TCI), TIBCO Mashery and Hyperledger Fabric running as IBM Bluemix cloud service. Hyperledger is a vendor independent open source blockchain project which consists of various components. Many enterprises and software vendors committed to it for building different solutions for various problems and use cases. One example is IBM’s Hyperledger Fabric. The benefit of being a very flexible construction kit makes Hyperledger much more complex for getting started than other blockchain platforms, like Ethereum, which are less flexible but therefore easier to set up and use. This is the reason why I use the BlueMix BaaS (Blockchain as a Service) to get started quickly without spending days on just setting up my own Hyperledger network. You can start a Hyperledger Fabric blockchain infrastructure with four peers and a membership service with just a few clicks. It takes around two minutes. Hyperledger Fabric is evolving fast. Therefore, a great example for quickly changing features, evolving requirements and (potentially) fast failing projects. However, when I began the project, it was already clear that the REST interface is deprecated and will not be included in the upcoming 1.0 release anymore. Thus, we are aware that an easy move to another API is needed in a few weeks or months. iPaaS: TIBCO Cloud Integration (TCI) is hosted and managed by TIBCO. It can be used without any setup or installation to quickly build a REST microservice which integrates with Hyperledger Fabric. TCI also allows to configure caching, throttling and security configuration to ensure controlled communication between the blockchain and other applications and services. API Management: TIBCO Mashery is used to expose the TCI REST microservice for other services consumers. This can be internal, partners or public end users, depending on the use case. On Premise / Cloud-Native Integration Infrastructure: TIBCO BusinessWorks 6 (BW6) respectively TIBCO BusinessWorks Container Edition (BWCE) can be used to deploy and productionize successful TCI microservices in your existing infrastructure on premise or on a cloud-native platform like CloudFoundry, Kubernetes or any other Docker-based platform. Of course, you can also continue to use the services within TCI itself to run and scale the production services in the public cloud, hosted and managed by TIBCO. Create a REST service which receives customer ID and customer name as parameters. Enhance the input data from the REST call with additional data from Salesforce CRM. In this case, we get a block hash which is stored in Salesforce as reference to the blockchain data. The block hash allows to doublecheck if Salesforce has the most up-to-date information about a customer while the blockchain itself ensures that the customer updates from various systems like CRM, ERP, Mainframe are stored and updated in a correct, secure, distributed chain – which can be accessed by all related systems, not just Salesforce. 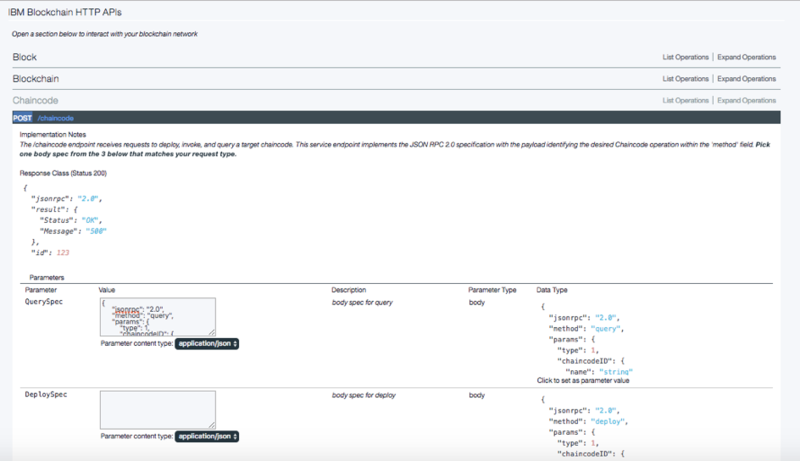 Leverage API Management to expose the TCI REST service as public API so that external service consumers can subscribe to a payment plan and use it in other applications or microservices. This section discusses the relevant steps of the implementation in more detail, including development and deployment of the chain code (Hyperledger’s term for smart contracts in blockchain), implementation of the REST integration service with visual coding in the IDE of TCI, and exposing the service as API via TIBCO Mashery. Hyperledger Fabric has some detailed “getting started” tutorials. I used a “Hello World” Tutorial and adopted it to our use case so that you can store, update and query customer data on the blockchain network. Hyperledger Fabric uses Go for chain code and will allow other programming languages like Java in future releases. This is both a pro and con. The benefit is that you can leverage your existing expertise in these programming languages. However, you also have to be careful not to use “wrong” features like threads, indefinite loops or other functions which cause unexpected behavior on a blockchain. Personally, I prefer the concept of Ethereum. This platform uses Solidity, a programming language explicitly designed to develop smart contracts (i.e. chain code). The last point is very important in blockchain projects. A blockchain infrastructure does not have millisecond response latency. Furthermore, every blockchain update costs money – Bitcoin, Ether, or whatever currency you use to “pay for mining” and to reach consensus in your blockchain infrastructure. Therefore, you can leverage caching and throttling in blockchain projects much more than in some other projects (only if it fits into your business scenario, of course). The deployed TCI microservice can either be accessed directly by service consumers or you expose it via API Management, e.g. with TIBCO Mashery. The latter option allows to define rules, payment plans and security configuration in a centralized manner with easy-to-use tooling. Note that the deployment to TCI and exposing its API to Mashery can also be done in one single step. Both products are loosely coupled, but highly integrated. Also note that this is typically not done manually (like in this technical demonstration), but integrated into a DevOps infrastructure leveraging frameworks like Maven or Jenkins to automate the deployment and testing steps. Our scenario is now implemented successfully. However, it is already clear that the REST interface is deprecated and not included in the upcoming 1.0 release anymore. In blockchain frameworks, you can expect changes very frequently. This blog post focuses just on a small example, and Hyperledger Fabric 1.0 will bring other new features and concept changes with it, of course. Same is true for SaaS cloud offerings such as Salesforce. You cannot control when they change their API and what exactly they change. But you have to adopt it within a relative short timeframe or your service will not work anymore. An iPaaS is the perfect solution for these scenarios as you do not have a lot of complex setup in your private data center or a public cloud platform. You just use it “as a service”, change it, replace logic, or stop it and throw it away to start a new project. The implicit integration into API Management and DevOps support also allow to expose new versions for your service consumers easily and quickly. Blockchain is very early stage. This is true for platforms, tooling, and even the basic concepts and theories (like consensus algorithms or security enforcement). Don’t trust the vendors if they say Blockchain is now 1.0 and ready for prime time. It will still feel more like a 0.5 beta version these days. This is not just true for Hyperledger and its related projects such as IBM’s Hyperledger Fabric, but also for all others, including Ethereum and all the interesting frameworks and startups emerging around it. Therefore, you need to be flexible and agile in blockchain development today. You need to be able to fail fast. This means set up a project quickly, try out new innovative ideas, and throw them away if they do not work; to start the next one. The same is true for other innovative ideas – not just for blockchain. Middleware helps integrating new innovative ideas with existing applications and enterprise architectures. It is used to interconnect everything, correlate events in real time, and find insights and patterns in correlated information to create new added value. To support innovative projects, middleware also needs to be flexible, agile and support fail fast methodologies. This post showed how you can leverage iPaaS with TIBCO Cloud Integration and API Management with TIBCO Mashery to build innovative middleware microservices in innovative cloud-to-cloud integration projects. This entry was posted	on Sunday, April 23rd, 2017 at 20:41	and is filed under API Management, Blockchain, Cloud, Cloud-Native, Docker, EAI, ESB, Microservices, Middleware. You can follow any responses to this entry through the RSS 2.0 feed. You can leave a response, or trackback from your own site. Powered by WordPress v 5.1.1. Page in 0.231 seconds.